최고의 안전에 도전하는 더 뉴 엘란트라. 당신은 무엇에 도전하고 있나요? 지금 당신의 도전과제를 공유하시고 Amazon.com 기프트 카드 당첨의 기회를 잡으세요! 더 뉴 엘란트라 ‘도전과제 자동 생성기’로 도전과제를 만들어보세요! 도전과제를 입력하시거나 '도전과제 자동 생성기'를 사용해 보세요. 이벤트 당첨시 상품 수령을 위한 정보를 입력하여 주시기 바랍니다. 수집된 정보는 정해진 목적 이외의 용도로는 이용되지 않습니다. 미국의 합법적인 거주자로써 만 18세 이상임을 확인하며, 이벤트 룰과 개인정보 정책에 동의합니다. Please check mark if you are over 18 years of age. *현대자동차 딜러로부터 연락을 받고 싶습니다. 전화 연락을 받기를 원하시면 아래의 내용을 읽고 동의하셔야 합니다. 동의하지 않으실 경우 전화 대신 이메일로 연락을 드리겠습니다. 나는 현대자동차나 현대자동차 공식 리테일러 또는 그 대리인이 자동 전화 시스템을 이용하여 보내는 텔레마케팅 전화나 문자 메시지의 수신에 동의합니다. 나는 이러한 동의 여부가 제품 구매나 서비스 수신과는 아무런 관계가 없음을 이해했습니다. 통신 요금이 부과될 수 있습니다. 당첨자는 이벤트에 참여해 주신 분 가운데 무작위 추첨으로 선정됩니다. 2019년 4월 26일 당첨자는 본 웹페이지를 통해 발표되며 제공해주신 전화번호와 이메일 주소로 개별 통보 해드립니다. 당첨자 통보 이후 24시간 이내 상품 수령을 위해 응답하지 않으실 경우 당첨이 취소될 수 있으며 다음 당첨자에게 기회가 돌아가게 됩니다. 본 이벤트는 미국 내 합법적인 거주자로써 만 18세 이상이신 분들만 참여하실 수 있으며, 한 분 당 한 번만 참여하실 수 있습니다. 비정상적이거나 불법적인 방법으로 이벤트에 참여하신 경우 당첨자 선정 대상에서 제외될 수 있으며 당첨 후에도 취소될 수 있습니다. 제공되는 상품은 이미지와 다를 수 있으며, 사정에 따라 유사 상품으로 대체될 수 있습니다. 1. Forward Collision-Avoidance Assist(FCA) and Automatic Emergency Braking(AEB) with Pedestrian Detection help detect pedestrians, but not in all conditions. FCA and AEB are designed to assist drivers to avoid, or reduce the severity of, collisions with cars that have slowed or stopped in front of them. They are supplemental assist and do not replace the need for extreme care and attention by the driver. FCA and AEB may not stop the vehicle completely and will not avoid all collisions. See Owner’s Manual to learn more. 2. Do not rely completely on Blind-Spot Collision Warning(BCW) and be sure to use proper lane changing procedures. BCW may not detect every object or vehicle and will not prevent accidents. Lane Change Assist provides an audible and visual alert if the turn signal is activated and another vehicle in the blind spot is sensed. There are limitations to the function, range, detection and clarity of these systems. See Owner’s Manual for details. 3. Lane Keeping Assist operates above approximately 44 mph and only when the lane markings are clearly visible on the road. It will not work under all circumstances and will not prevent loss of control. It is a supplemental assist, and does not replace the need for extreme care and attention by the driver. See Owner’s Manual for details. 4. Based on total package of warranty programs. See dealer for LIMTED WARRANTY details. 5. Original owner only. 엘란트라가 당신의 도전을 생성하는 중입니다. 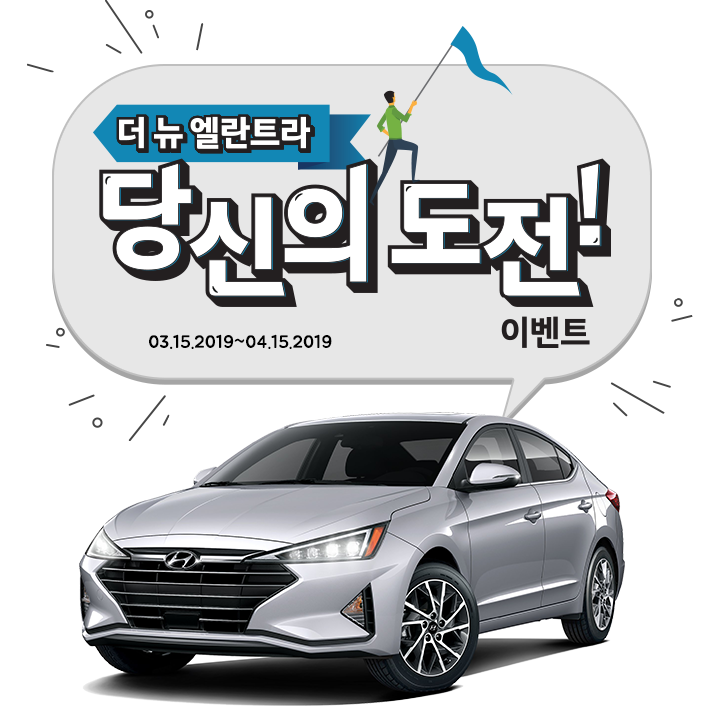 더 뉴 엘란트라의 Apple CarPlay 와 Android Auto는 당신을 위해 엄선된 앱들을 스마트폰 스크린이 아닌 엘란트라의 터치스크린을 통해 좀 더 안전하게 사용할 수 있게 해줍니다.